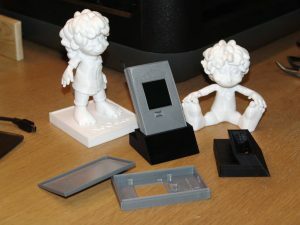 The age of the 3D printer is upon us, well – the industry would have us believe that it has been upon us the last 5-10 years, but the truth is that it takes a lot of knowledge to get any productive use of a 3D printer. For D.I.Y. enthusiasts like yours truly, this should have had happened yesterday – but better late than never. I’ve been busy printing like mad ever since I bought my very first 3D printer. The manufacturer would like us to believe that printing 3D is as simple as downloading your model from the net and then hit PRINT. Well, yes – sort of, if you’re into STOCK models and don’t do anything yourself, then yes…until your printer clogs up OR your printer won’t print the model correctly etc. This is why you see so many 3D printers for sale in Craigs-List and the listing usually says: As new…only used TWICE etc. Most people don’t have the time, skills or knowledge to do their own proper 3D work as 3D modeling is a skill that takes YEARS to master. Yours truly here have roughly 20 years modeling experience both privately and for the industry so for me this is a gift from above, the 3D printer was the MISSING link in my life, and now I’m hooked. From the images you can see: Noodles (My character design) on a pedestal with his name, rough print – took 5 hours to print out. In the middle you see a finished prototype of an Arduino Enclosure I made for the Arduino Nano v3.0 AND a 1.44″ Color TFT screen. The button is an Reset-button, no springs or screws needed as I designed the enclosure itself to take care of those details. To the Right: Again – Noodles printed in NORMAL mode which gives a clean nice surface, roughly 7 hours to print. The Black Sockets you see in the images took between 2 hours and 1 hour to print, the 2 hour one has an USB charging socket + print/PCB holders + an DC 9v jack to it, and the 1 hour version is just a socket with no advanced details.